Whether you attend Lama Zopa Rinpoche’s teachings in person or read his words, you will often find him talking of the suffering of the animal realm. When you reflect on animals’ suffering, it should bring about a wish not to be born in a similar situation. In studying karma, the law of cause and effect, we can learn what actions can lead us to such miserable existences and how to avoid creating them. We can also learn what practices to do to purify the causes that we have already accumulated. Rinpoche tells us that as humans we have such an unbelievable opportunity to create the causes of happiness and purify the causes of suffering. What about animals? How easy is it for them to do this? Rinpoche says that even if you explain the idea of cause and effect to a dog for a zillion years, as an animal he still won’t understand, whereas as humans we can grasp the idea in an instant. We all have buddha-nature and the potential to reach enlightenment, but beings in the lower realms are continually creating negative karma. If we consider that fellow sentient beings, our kind mothers from past lives, are trapped in the animal realm, compassion may arise. When we really investigate their situation, the wish to do something naturally becomes stronger. “In your early meditations on compassion, take as your object a sheep being slaughtered by a butcher; you will easily and quickly develop compassion. You must contemplate the way the sheep dies, the sadistic way it is killed, and how it dies in a state of unbearable agony and terror. The sheep is turned up-side-down and laid on its back. Its legs are tied together with rope. It can tell its life is threatened, but it is helpless, cannot escape, and has no protector or refuge to turn to. Its eyes are full of tears and it stares into the butcher’s face.” (Pabongka Rinpoche, Liberation in the Palm of Your Hand). What can we do? There are three things: 1) do your best not to contribute to the harm that befalls animals; 2) give them protection; and 3) give them Dharma. The first can be achieved by examining your own life and seeing how it may adversely affect animals (including insects). Which beings live with you or around you, and how does your lifestyle affect their daily struggle for survival? What do you eat and use that may involve the killing and suffering of animals? Becoming vegetarian or vegan can greatly reduce your financial and social support of harmful practices. Just think, some of the cosmetics that you use, even shampoo, may have come from a company that used outdated animal testing in its production. Rabbits locked in racks have various products poured onto their eyes to determine how bad a reaction there is and what is an acceptable irritant level. Just think, if you buy a product that says “not tested on animals,” you are directly, and with market force, supporting the reduction in harm to animals. Just think, if you buy chicken you are supporting an industry that kills 9 billion chickens in the United States alone every year. The vast majority are kept in terrible conditions to ensure high production. Just think, if you give up eating meat, you are directly, and with market force, supporting the reduction in harm to animals. The second thing we can do to benefit animals involves directly protecting animals that are at risk from harm: animals rescued from being euthansized, insects caught in puddles, animals about to go to slaughter, injured wildlife on the side of the road. You can also do this by helping those who are primary carers of animals in need of financial support to provide shelter, food, medicine and veterinary care. The third, giving Dharma, is sometimes the easiest but also the most important. Stopping to blow a mantra on an insect, reciting a sutra to the birds in your backyard, playing a Dharma CD to your pets while you are out, And, of course, circumambulating them around holy objects are all excellent was of contributing to an animal’s happiness. .
How many of us are around animals including insects and never think to give them Dharma? Or perhaps we say a few mantras now and then, but don’t consider circumambulating them. How often do we really investigate the opportunities that we have to help these beings who are trapped in the lower realms, with so few opportunities to create merit and the causes for higher rebirth and enlightenment? If we don’t take these small opportunities, how much longer will that being have to wait for the causes and conditions to come about for greater happiness? Enlightenment for the Dear Animals promotes World Animal Day (October 4) as a day for FPMT students to take extra time to think about and do practices to help beings in the animal realm. This year, several groups came together at different places to practice for the benefit of animals. In San Jose, California, Gyalwa Gyatso Buddhist Center, Geshe Wangdu visited and gave a teaching on the plight of the animal realm and the benefits of practicing compassion. He then led everyone in chanting the Chenrezig mantra. “We came away with a renewed appreciation for the suffering of being reborn in a body with such a limited capacity to accumulate merit and practice the Dharma,” said one student. MAITRI Charitable Trust in India did a huge animal blessing, with dogs, goats and chickens receiving extra imprints for enlightenment. Jamyang Centre in London organized a day for students and visitors to reflect more deeply about animals while students at Hayagriva Buddhist Centre, Perth, Australia did the Chenrezig sadhana and recited mantras. 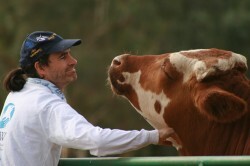 In Australia, one group of prisoners (from Area 2 and 3 of Long Bay Correctional Centre) did Chenrezig practice and dedicated the merits to the animals. Anna Carmody, who led the practice says that “several of the prisoners took the practice away with them offering to continue in their cells.” Also in Australia, Vajrayana Institute did an animal blessing with many pets and people circumambulating their big stupa. Enlightenment for the Dear Animals traveled to Vilnius, Lithuania and the following weekend to Ljubljana, Slovenia to help Buddhist study groups conduct their first ever animal blessing day. 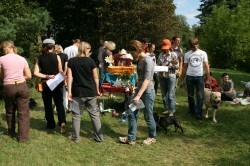 People came to listen to a talk on how they can reduce harm to animals and bring them the benefit of Dharma. With strong faith they circumambulated with their animals while reciting prayers and mantras around many holy objects including relics and holy objects donated by many lamas. Later, animals at Farm Sanctuary, California, were bopped on the head with a special statue, and many mantras were recited for those animals that have escaped the horror of US agribusiness. Many people also did mantras and practices at home. One student wrote saying, “We shall say om mani padme hum with our goldfish, guinea pigs and chooks all weekend for the benefit of all sentient beings.” Another ventured into her local bushland saying mantras to the wildlife: “The bushland near where I live is full of wildlife, so I am sure there was lots of benefit for them.” One student reported doing mantras for all the animals in the oceans while he flew over the Pacific. Enlightenment for the Dear Animals also supports activities where animals are directly rescued from harm such as the animals at the Animal Liberation Sanctuary, Nepal, the many animals at MAITRI, India, the companion animals at Metta Cats, Singapore, and the dogs in Dharamsala treated by Tibet Charity. 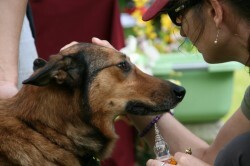 We also hope to aid in the treatment of the many dogs at Sera Monastery in South India. With your support, we can grow to help even more animals and people. 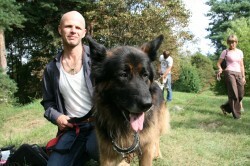 Please visit our Enlightenment for the Dear Animals for more information. And remember, buddha-nature is the same in all living beings, only the form is different.